Focus: To learn the secrets of running an engaging Facebook group where members will be kept motivated and inspired to become a community. 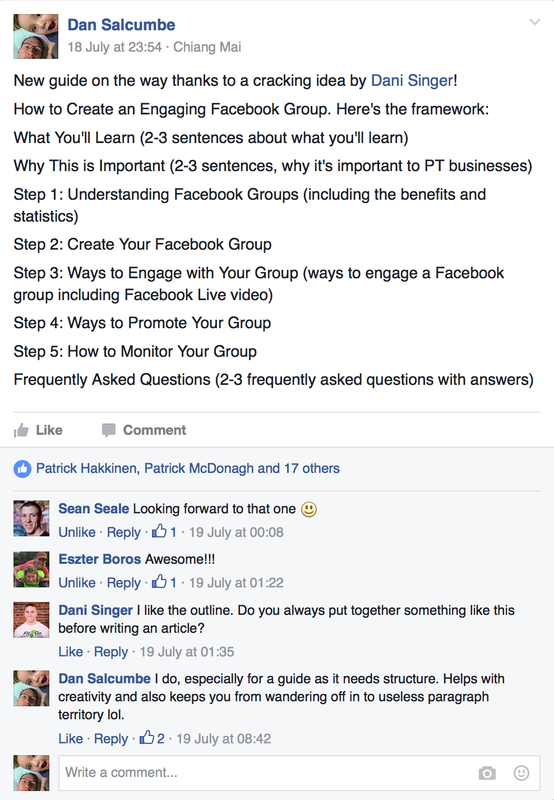 ​In this lesson, you’re going to learn all about how to create an engaging Facebook group for your personal training business. You'll discover how to set up your Facebook group, what they can be used for and why they are important. We will also show you how to promote and monitor your group while engaging your group in interesting and exciting ways. Is Facebook still the centre of social networking for members of the general public? The answer is, probably, yes. While it may seem like it's being overtaken by the new kids on the block like Snapchat and Instagram, Facebook is still a fundamental marketing tool that can be used by personal trainer businesses. There are still hundreds of millions of people that use Facebook every day. In fact, recently there were one billion people active on Facebook at the same time. Facebook still opens a world of possibilities for business owners that you need to take advantage of. You might wonder what the difference is between the reach of a Facebook page and a Facebook Group. When you compare the numbers, the differences are staggering. You may have the same number of likes on a page as you do members of the group. You can run a quick test and see which one is more effective at gaining views for your site. You can take a URL from your site and post one to your Facebook page and one to your group at the same time. After a day compare the results. You’ll find the group is nearly fifteen times more effective at generating views. Why is this? It’s all to do with how much you can engage people when you use a group, compared to a page. Over the last 3 months I’ve driven well over 100,000 organic visits to my site, the majority of which are coming from Facebook groups. ​​How do I know they’re organic? Because I don’t pay for ads! 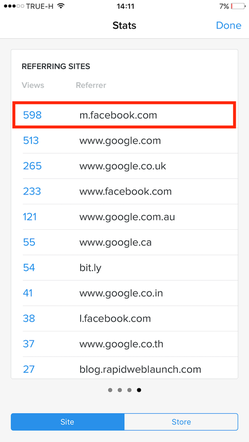 I rely 99% on organic traffic from Facebook and Google. Thus when using a Facebook group, compared with a page, you can generate views with a single post. We’re not talking about small numbers here either. With a group of 2700 members, you could generate 600 views per post. That’s roughly a 22% visit rate which is huge when you view the stats as a big picture. ​It’s not the only benefit either. Facebook Group pages can generate free content for your business. Essentially, the group becomes crowdsourced from all the members. They post the content for you to get the interest for your PT business that you want and need. As long as you check for spam and stay active, the group runs itself. It will generate the organic reach for your business without you having to lift a finger. It becomes a self-fulfilling marketing campaign. 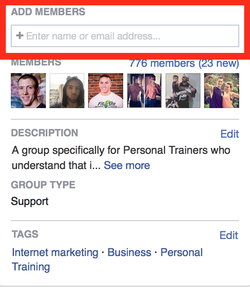 Setting up a Facebook group is just as easy as setting up a Facebook profile. If you’re interested in using this strategy, you can get one up and running in minutes. 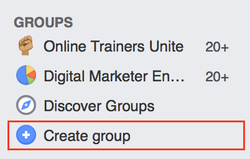 All you need to do is click ‘create a group’ on your Facebook profile and away you go. Whether or not it will be successful in generating views for your site and interest in your business is another matter. As such, we need to focus on the context and idea behind your group. If you have a recognised brand that people are happy to associate themselves with, you can base your group around this. Unfortunately, as a small PT company, you may not have a big brand to build on. As such you need to think about context carefully. You need to make sure that your group is appealing to your target member. Next, we need to think about how to make sure you are engaging with your group on Facebook. Choosing the right context for your group is a good start, but it’s only the first step in a winning campaign. One of the biggest mistakes you can make here is just linking your blog constantly in the group. There are a couple of reasons why this isn’t the right move. First, group members may already be aware of your blog, and they might have read the posts. Second, the content needs to be native content that is purely for the group. There are plenty of fun and valuable pieces of native content that you can use. The content you're linking to was the group's idea! Polls are also a great idea because you can engage the group by asking them questions. You can then start a discussion on group topics. Usually, you’ll have two discussions. There’ll be one where people are discussing their answers to the poll. There will be another when the final result of the poll is revealed. Here's one by Aidan which is a simple but VERY effective way to find out where he should be spending his time. Offering to answer questions for group members is a great way to both engage your group and find great marketing material. Your members get their questions answered and you get loads of feedback on what your current members problems are. You can use their questions to create more marketing materials to appeal to potential clients outside of your group. Here's another one from Aidan. Basically, anything that is visually interesting and is appropriate within the context of your group. They usually come in the form of an inspirational quote, a "what not to do image" or a great example of someone doing something right. ​Native video uploads are incredibly effective. Rather than just text or motivational phrases, you can fully connect with the group. They can respond to the video as well, and this type of content can be very effective. It’s one of the reasons why apps such as Snapchat have become so popular. If you use this type of technique, you will then be able to add links to your blog. People will trust your content enough in the group to click on these links without hesitation. I checked the feeds of the Lie vids that I managed to get on and there wasn't LOADS of promotion before hand. Make a big deal of your Facebook live vids to get more people excited and more live viewers. 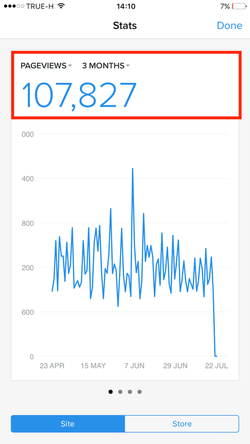 I was surprised to see that archived views often exceeded live views. Try adding a call to action at the end for your archived visitors ("For those of you who missed this live vid, hop on the next one at..."). Some of you guys were great at this, others not so much. One PT in particular, Carl Norman, did a great job of even introducing ME to his group lol. He also said hi to any new viewers who hopped on the live vid and this resulted in more comments than all the live vids I hopped on. There are plenty of different ways to promote your group. Though, perhaps we should start by how not to do it. You may be tempted to simply build up your group numbers as quickly as possible. The fastest way to do this is to add them yourself. But here;s why you shouldn't do that. 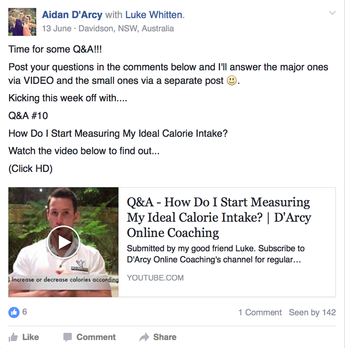 You might have a lot of followers on Facebook already for your PT company. However, that doesn’t mean you should add them to your group. You have to let them join naturally. Otherwise they are just going to find it annoying. As well as associating your group with spam, people who don’t want to be there won’t engage. 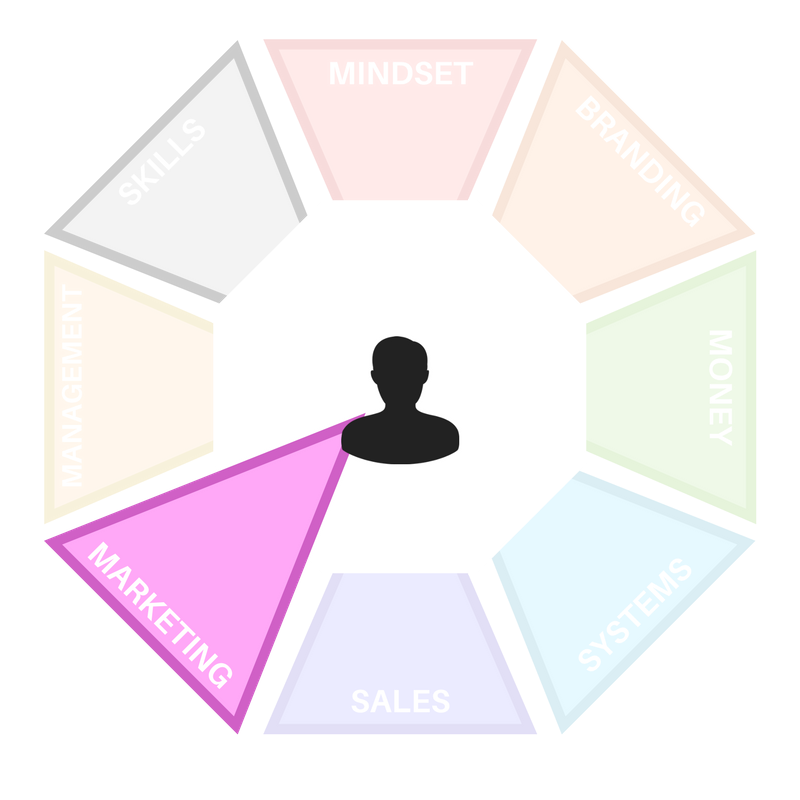 Which is a key part of the Facebook Group marketing model. ​Instead, you can share the content of influential people who you want in your group. Make sure you tag them so they know you shared their post, and they might join your group without your input. It's also acceptable to inform someone that you've been talking to that you will add them to the group. This gives them an opportunity to say no. Alternatively, you can promote the group yourself on your site. If your site is already driving traffic, you can switch your Facebook link with a link to your Facebook group. You can also use content to promote your group. Specifically gated content or content that can only be accessed by joining the group. You can promote it on your Facebook page with links. However, if they want to download, they must join the group first. Remember, monitoring your group is an important step for an effective Facebook Group marketing strategy. Every so often, you may want to thank current group members and give advice to new members. Make sure that you lay out the rules of your group to avoid spam and junk content. If you do this, you will keep your group a healthy area for marketing online. ​You can’t give second chances either. If you see spam, you’ve got to delete it and ban the member that posted it. 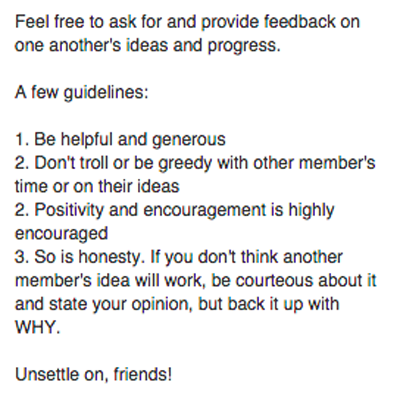 Encourage other members to point out spam and other rubbish that might appear in the group, such as self-promotion. If you notice that there is a nasty argument in the group, PM those involved. You should be able to break it up without causing too much disruption between group members. You can also consider hiring a group moderator or appointing one. However, if you make the rules of the group clear, this shouldn’t be necessary. CAN I PROMOTE MY GROUP LIKE A FACEBOOK PAGE? No, but you can use your Facebook page to promote the group. Post a piece of content to your Facebook page, including a group link. This has the same effect, even though Facebook does not allow direct group promotion. HOW LONG WILL IT TAKE TO MAKE A GROUP SUCCESSFUL? It depends on how much time you can put into it. We find that a PT business group can build up its members in a couple of days, using the right techniques. You just need to make sure that the context of the group is something potential members will be interested in.